Hi Everyone! Just a card I made last night. Just a simple layout. I was playing around with my oval punch and created the flower. Do you buy the Paper Craft magazine? I still buy it but since I've discovered blogging, the creations in magazines are no longer as impressive as those I see on blogs. I still purchase the magazine because the card samples in Paper Craft are "scrappy cards" and I don't know too many blog sites that post cards other than rubber stamped cards. Do you know of any blog sites that post card creations that are not rubber stamped. . .you know, blogs that post "scrappy cards"? If you do. . .please comment and add the link of the blog sites. I would love to visit sites for inspirations. I'm primarily a rubber stamper and I'm trying to master "scrappy cards". . .LOL! Any inspirations will be helpful!! I stamp occasionally, use scrapbook papers, magazine clippings, junk mail, whatever! Maria , did you see the email I sent to you? I luv your scrappy cards & this one is great! Luv that flower! 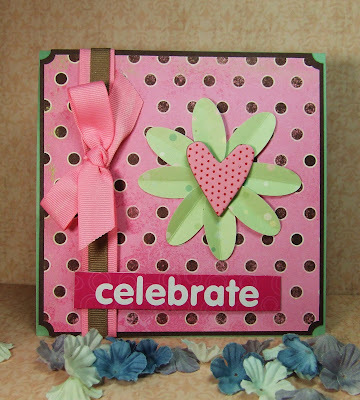 Love your pink flower card! I am with you on magazines- with the advent of the net it is faster to surf eye candy then to buy a magazine. Plus if you have a question the artist is more likely to respond to a comment or question about their work. What a great way to use the oval punch! Your scrappy cards are awesome Maria and I love the results of using your punch!!!!! In my opinion, you have mastered scrappy cards. Making these cards are not easy and your finished projects are awesome! p.s. I hope these pain management sessions help, I have pinched nerves in the worse possible areas. (neck and back) I think one day I will have to have surgery to help relieve the pain. Your card is darling. I too love PC and would love to do scrappy cards. I do read lots of scrappy card blogs yet I'm still too afraid to try doing them. I think you'll love these. 1. http://caardvarks.blogspot.com The side bar has the DT and they have awesome work. Truly a fabulous site. Her work is always published. This should get you started. Enjoy! hehehe !! what a coincidence Maria !! well...i just posted some cards in my blog ..i mean some have stamping on it and some ...have papers that i'm trying to use instead of....collecting them huh ??? lol !! !